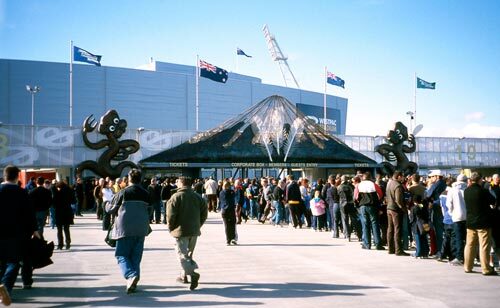 A crowd waits to enter a rugby game at Westpac Stadium. Nicknamed the ‘Cake Tin’ – because of its shape and metal façade – the stadium was opened in 2000. It replaced Athletic Park as Wellington’s main rugby venue. It is also used for one-day cricket games, concerts and other big events. A large sculpture of Mt Taranaki over the entrance symbolises the link between Wellington Māori and their ancestral home in Taranaki.